I love a low loft pillow and this does not disappoint. It’s a little fluffy for a low loft and not as scrunchy as I like but it does the job of supporting my head in alignment with my spine without tweaking my neck up. I sleep like a baby! Good quality pillow. 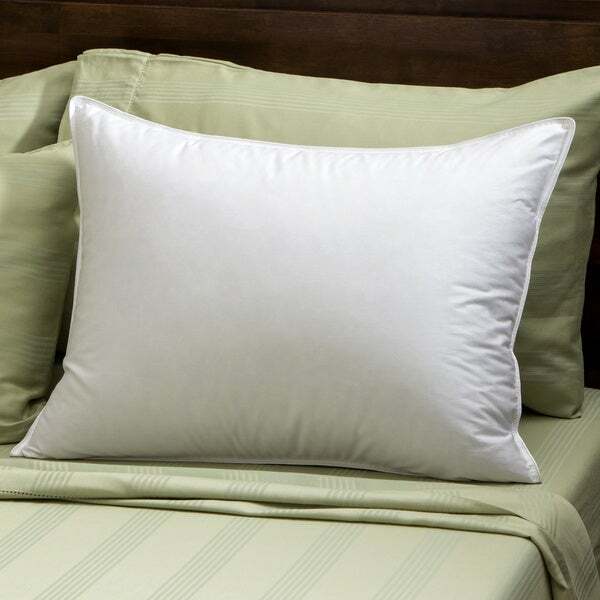 Enjoy a luxurious night's sleep when you rest your head on this goose down pillow. The soft Pima cotton construction offers an ultra soft texture, and the standard size lets this pillow fit on virtually any bed. Corded edges provide a finished look for this bedding piece, ensuring a great look on your bed even without a pillow case. Everyone knows how difficult it is to find the RIGHT pillow. I perused many pillows online and in stores before purchasing and decided on this WONDERFUL pillow based on the following criteria: It had to be STERILIZED goose down ONLY with NO feathers, 100% cotton high thread count (400) outer shell, and MADE IN THE USA. This pillow did not disappoint. It has 12 oz of down and the product label confirms all of the above criteria. Please realize when you purchase a goose down pillow, even though it states 100% goose down, the label will always read '75% goose down.' This is what the law requires due to technicalities in stuffing, it's not because of false advertising or that you're being ripped off. Personally, I do NOT like an overfilled pillow that is hard and can't be molded somewhat to my neck as I've had serious back and neck injuries. This pillow isn't too soft or hard at all ~ it is just right! It is so COMFORTABLE and about as perfect as a pillow can be. It gives just enough support and does NOT go flat. There is no awful animal smells whatsoever even right out of the box. This is one of the best pillows I've ever found and well worth the money. Be sure to protect your pillow with a zippered pillow protector with a high cotton thread count so it will last longer and stay cleaner. I plan to purchase this product again. Glad to find this with a downproof cover. This is a fine quality pillow. So many have covers that are not dense enough to prevent the excape of down. The minimum density for a cover is 400 threads per inch, which this pillow has. It is very comfortable and has no odor. I look forward to many years of use. I like this pillow the best of the 2 brands that I bought. It is well made, super soft and not filled so much to trade off flexibility in molding to your neck/head. So glad I bought this item. At first I was disappointed because when I got it, it read only 95 percent down, but I decided I would try it anyhow. So after a few weeks I think it is pretty good. It's very soft but puffs right back up to its shape after you lift your head off. It's not the best pillow I've had but for the price I think it's very good. It's cuddly soft, if that makes sense to you. Well made. This pillow is just right. I only use a down pillow and mine had to be replaced. It was super old and had no form left. This is so perfect I sleep great from first night on. Love it. I love it! It is soft and cuddly. I intend to sleep on this kind of pillow for the rest of my days. excellent sleep on this very soft pillow. I will buy more. Bought it for my Mom--She LOVES it! I bought 1 pillow as a test. My Mother said that it was so soft it has become her favorite pillow. I then bought her another to complete the set. This is a great pillow if you like softness. This pillow is just right for me. Not too big, but just enough for a back sleeper. Very soft, nice covering, and dense without being hard. when they say this is soft its an understatement, could scrunch it up into the palm of my hand..... also when returning the item this wonderful site asked for $12 to facilitate the return. It cost me $2 through the mail to do it myself! Thanks Overstock!! Great pillow. Very soft, but returns to shape when you arise. Not a comfortable pillow. I have been trying to find some down and down alternative pillows since we have serious joint issues. Just wanted a comfortable bed. Ordered from several sources this type of pillow to compare. one of my least favorite. I had been looking to replace my down pillows that I had had for 30 years. After seeing what new down pillows cost I decided to try alternative down pillows and I was so disappointed I decided to pay the cost to get real down pillows and I am happy to say these are so much better. I shopped for days looking for 100%down pillows... not feathers! I love these they are perfect but wish I could of got them in a king size. "Is this brand of pillow “Downlite” by chance? Looking to reorder." "Below you have stated that this pillow is 100% Goose Down, But in another Answer you have stated that it is 75% Goose Down. Which is it, 100% or 75%? and if it is only 75% then what is used in the other 25% of the pillow?" "Yesterday, I purchased two of these pillows from you, assuming they were filled with 100% down. If they contain only 75% down, please let me know what the other 25% is made of. Please let me know ASAP so I can cancel my order, if necessary. Please let me know which pillows you offer that contain 100% down. Thanks very much." "How can you claim its 100% goose down, when in fact I bought it because you claimed that, but on the tag it says 75% goose down?!" Hello Phireballhot, I am sorry for any confusion. The 100 per cent is the cotton fabric. You will be contacted by the Customer Care team. I again apologize for any confusion that we caused. Neck problems. I have ordered a similar pillow from Overstock before. I wore it out and its time to replace it. Thanks so much for your fine merchandise! "Is this pillow 100% goose down? Where was it made?" Thank you for contacting us, madmax24. Yes, this is 100 % goose down and was made in the US. Please let us know if you have any further questions. Above Overstock says and other reviewers say that it is not 100% goose down. Which is it? "can you give me fill power of this pillow?" Hello xcuseme, the fill power ranges from 550 to 700. Have a great day!